You’ve probably seen a lot of news articles and social posts about cervical cancer and are wondering why? There is a reason for this. This week is Cervical Cancer Prevention Week and women nationwide, including me, are spreading the importance of having a smear test and encouraging women to get it done. I understand that all dignity is thrown out the window, but a painless 2-minute check really can be lifesaving. So here’s my story (I’ll leave out the graphics!). Like many women, I too put off having my smear test. I received the letter and ‘ignored’ it for a few weeks. The main reason being I didn’t have any symptoms, but I’ve learnt that sometimes there aren’t any. A few weeks went passed and by the time I finally went to book my appointment, I had to wait a further few weeks due to my period (sorry guys!). By that point, two months has passed from receiving the letter and actually going. Anyway, I went, had it done and waited for the results. Not long before the results arrived, we received some bad news in the family. A very much loved and close family member received the news that he had cancer, but unfortunately, time was against him; 11 weeks to be exact. Whilst the family were getting our heads around this tragic news, my results came and I feared the worst. The words ‘high grade’ and ‘severe’ stood out like a sore thumb. I needed to go for a colposcopy (it sounds worse than it actually is), so they can take a closer look at my cervix and remove any abnormal cells. I felt physically sick and broke down in tears. I kept thinking ‘what if this is it?’ I was nowhere near ready. I panicked and came into work an utter mess. With the news of my uncle and then this letter, I needed to pull myself together and be strong, because we don’t know what the outcome is. This is why we have smear tests, to catch it early and prevent it from developing. Although I kept it from the family until I had more information, I was fortunate to have a strong support from the guys at PushON, which I am grateful for. I won’t go into too much detail, but it’s not painful. It’s more of a thorough look inside ‘you know what’, so they can detect the abnormal cells. To wrap it up, abnormal cells were confirmed (grade 3 following on from the results), small biopsy was taken and a loop diathermy under local anaesthetic was performed to remove these cells. Again, it was a painless procedure; you may feel a slight discomfort but that’s it. Following on from this, I went for another smear test six months later and the results came back clear. The abnormal cells were removed. I felt so much more relieved and that I could breathe again, as all the worry was wiped away. More importantly, I felt lucky. Reality slapped me across the face and now I live for the moment, and try not to take things for granted. The nurses at St Mary’s Hospital in Manchester were brilliant. They made me feel relaxed and distracted me from the treatment. The moral of the story is ladies, don’t avoid your smear test. When the letter arrives, book your appointment straight away. Sure, it’s embarrassing, but remember, the nurses aren’t embarrassed so you shouldn’t be either. More importantly, a quick swipe inside that is painless and super quick can save your life. If abnormal cells are found, don’t panic and think positive. I’m sure that either you will know someone who has been through it, or a friend will know someone who has. It’s more common than you think and you’re not alone. The procedure is pain free – honestly! 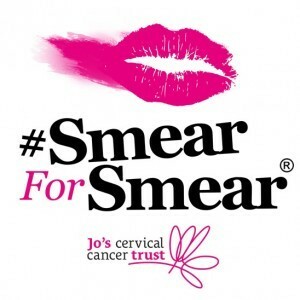 It’s Cervical Cancer Prevention Week and Jo’s Trust has launched a #SmearForSmear campaign. They want every woman to share the importance of having a smear test, and reach as many women as possible with this message, encouraging them to book their appointment. Get involved with Jo’s Trust #SmearForSmear campaign, by simply use this hashtag and tag @JoTrust on Twitter or @joscervicalcancertrust on Instagram. I did. If you have any of the above or any other symptoms that you are concerned with, please contact your GP straight away. It might not be anything, but it’s better to go. You’re not wasting anyone’s time. The NHS has more information about cervical cancer. So, book your appointment, wear your best knickers if you want and tell everyone! The more women who know, the more chance they are in going themselves. A bikini wax is much more painful than a smear test!